The pvc used by Sillaacapulco for weaving the original Acapulco chair is specifically designed and produced to create a durable and comfortable pvc cord. This flexible but strong cord guarantees that our chairs can be used both indoor and outdoor. We sometimes receive the question whether our Acapulco chairs and dining chairs are comfortable. At first sight the open structure of the weaving and the thin strings used might give the impression that they are not. Our pvc cords however are specifically designed and produced to offer ultimate comfort. The pvc cords are very strong and flexible and have a so called built-in "memory", which makes sure the seat of both the lounge chairs and the dining chairs forms itself to your body and quickly returns to its original shape after use. The strings are also very strong and impossible to break with your hands. All our Acapulco chairs and other cord-woven items are hand-woven with these strong PVC cords. 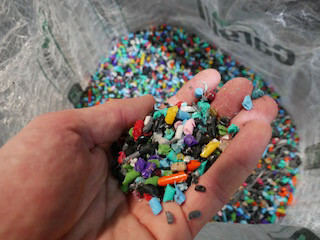 The pvc used to make the cords is sourced locally as much as possible and consists for a big part of recycled material. The pvc used is free of phthalates and what is even better is that we recycle the pvc leftovers from weaving other Acapulco chairs at the workshop in Mexico. These leftovers are then grinded and processed to re-use for the weaving of new Acapulco chairs. Isn't that great! During the production process the pvc cords are formed by heat and pressure and then cooled and collected at the end. The pvc used for our Acapulco chairs has a specific diameter and is treated so it can withstand sunlight. As said before, our pvc cord is flexible and forms itself to your body and returns to its original shape after use. Be careful when purchasing cheaper replica's, since they don't have these features and don't offer the same comfort. By the way, our cords are made in the same workshop as where our chairs are hand-woven. This assures short production times, high quality control and enables us to re-use left-overs from production and weaving. Less waste!! Isn't that beautiful?